It is assumed that Apple will stop allowing older 32-bit applications to run on future iOS system software releases. Essentially this means that it’s possible some older apps will stop working on an iPhone or iPad after the device has updated to some system software release, unless the developer updates those apps to include modernized 64-bit support. While this is all fairly technical and far beyond what the average iPhone or iPad user should worry about, it could potentially impact some users who rely on older apps, or apps which are no longer updated by developers. Thus, if you are curious if any of this may impact you or the apps you rely on for iOS, you can now check which apps are compatible and which may not be in the future. The ability to check for iOS app compatibility requires you to update your device to the most recent version, anything beyond iOS 10.3.1 will include the compatible app listing feature. The App Compatibility screen says “These apps may slow down your iPhone and will not work with future versions of iOS if they are not updated. 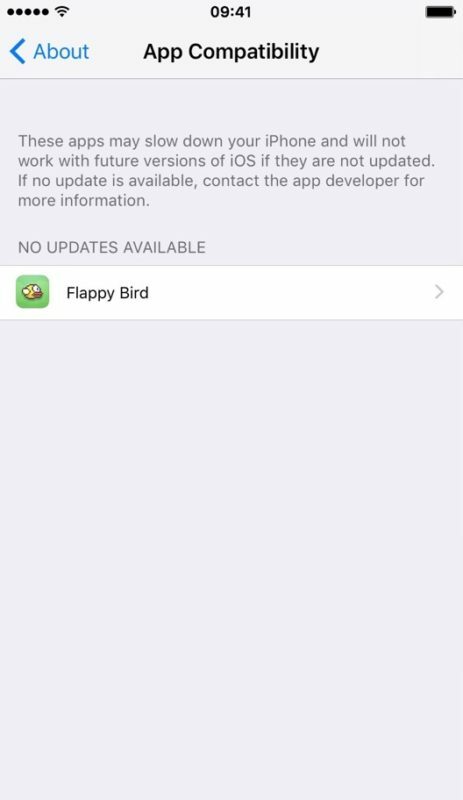 If no update is available, contact the app developer for more information.” The screenshot above shows the compatibility list containing a single app “Flappy Bird” which will be incompatible in the future unless it is updated. Don’t completely panic if you see an app on this list that you rely on regularly, as apps that are still maintained by developers will likely be updated to support the modern iOS requirements. But, if you have a mission critical app in this list that you use frequently and that is now abandonware or no longer updated or maintained by the developer, you may want to think about how you address that particular application going forward. One solution would be to find a new app to replace the old abandoned app, and another solution would be to avoid the iOS software update which renders old apps incompatible, though it’s unknown which release will disallow 32-bit app support, it is likely to be a major version release. It’s also a good idea to reach out to the developer of the application anyway and see if they plan on updating the app, perhaps a nice nudge will get a long abandoned app to be updated? You never know! I have 10.3.1 on my phone & I followed the instructions given but tapping on Applications within About does not do anything. It came up on mine. I have an arrow after “Applications” in the listing. I suspect if no arrow (have no idea why this would happen), you can’t see list. I have 10.3.1 on my phone and I followed the instructions above but tapping on Applications within About does not do anything. I think where it says “beyond 10.3.1” it means from 10.3.2 on. That’s how I read it. Very useful information, found 18 apps that show as may slow and will be incompatible. Many thanks. Which system number are you running? Which phone? I’m as are others above, nothing happens when I select applications. I am on an iPhone 6. I guess this only works with later models. 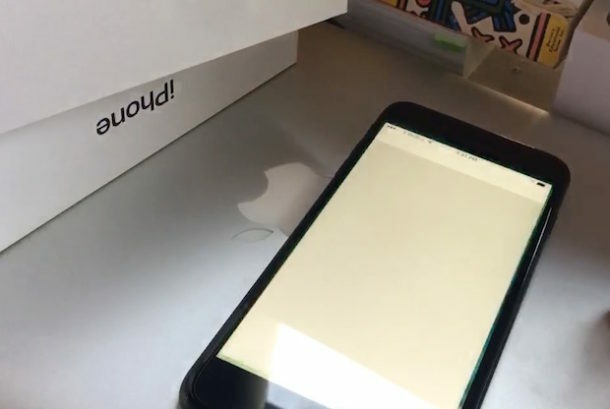 Hopefully one of the guys who has this feature working will let us know which model of phone they have. great, most of my apps are 32 bit. Did you click on in “General, About”? My full reply asked if you clicked on “Applications” in the above. Don’t know why that was deleted. Appreciate the info as I’ve had these warnings pop up and didn’t know what they were about. Contacted support for the one app I use all the time to track all my auto expenses and they are in the process of rewriting the app. Deleted 2 others I rarely use. The App Compatibility only shows up when there is at least one app that’s not compatible. If all your apps ate compatible, it won’t show you anything. I tried it. Once I removed the apps that were not compatible, I couldn’t get in. Then just go confirm, I reinstalled one of the incompatible apps, and viola! It shows up again. This is Part of why I stopped Upgrading my iOS – My apps do just what I want. Following the instructions above results in EVERY application on my iPhone showing up on the list of supposedly incompatible Apps. INCLUDING the Apps. included in iOS 10.3.1 itself — DRRR! Running 10.3.1 on a 6 Plus and I was shocked how many apps I have that show up on this outdated list. The most notable are VLC Blackboard Collaboration (web conferencing app), NPR Music, Tetris, Where… In fact, if one clicks on some it will take you to the App Store yet some will show an alert that they are no longer available. Even Turntabulator which I purchased the other day for $1.99 shows up on the list! It is recommended that everyone check if they have any such apps before they are let down when they need the app the most. If you don’t see the listing, it simply means you have no outdated apps. I have several incompatible apps on my iPad. yet I see no list. I am on the latest update. I would like to see a list so I can delete all the incompatibles.